Contact us today & find out about the Protera Advisory, Transformation and SAP Migration Services. Protera offers a very unique SAP Migration Assessment Report of your existing SAP environment – Protera will provide a detailed assessment report with a comprehensive list of current performance, usage metrics, and recommended SAP Migration plan. Working with the true SAP HANA and SAP S/4HANA certified experts makes upgrading, or migrating to an SAP HANA Cloud solution is stress free! With Protera’s FlexBridge migration automation platform, SAP users are able to accelerate their SAP HANA or SAP S/4 HANA project with a typical reduction in SAP migration cost and time by 45%-60% versus a traditional approach, primarily due to the migration methodology and automation tools built into Protera FlexBridge. Using smart automation to reduce complexity Protera FlexBridge can perform a HANA conversion in one step including; the SAP DB migration to HANA, the OS migration to Linux, the selective upgrade of SAP Applications to a more recent version, and UNICODE conversion if needed. 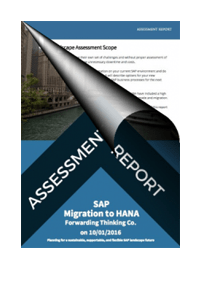 Protera offers a very unique SAP Migration Assessment Report service that that provides information you need to safely plan and optimize your SAP HANA or cloud migration projects. SAP production landscapes are as unique as your corporate business model and you have likely tuned them your way to best leverage your SAP investments to gain a competitive edge in your market. Protera FlexBridge℠ is a powerful automated SAP migration tool that streamlines the HANA and S/4 HANA Migration path. Built from the ground up by incorporating years of Protera’s SAP migration experience and best practices. Protera Technologies has developed a suite of state of the art utility based services that enable constant change while improving quality and reducing total cost of ownership.